Large, high-capacity casters, with wheels up to 3" wide and overall heights to 15-1/2". Kingpinless design means they swivel better under massive loads and last longer. Casters are available in multiple wheel options. Available with a wide variety of wheels in 3" width. Beefier legs and extended leads make 76 Series an excellent option for towing operation in automotive assembly plants, tire manufacturing and heavy-duty, demanding applications. Swivel sections are supplied with a lubrication fitting for field maintenance. The 76 series is case-hardened for extended service life, and will not crack like flimsier, through-hardened or induction-hardened casters. If our standard product line doesn’t meet your specifications, contact us for specification assistance. Cast Iron Wheels are exceptionally long wearing, have tremendous resistance to shock, and are a good choice for high capacity loads in warehousing and manufacturing. Recommended for rough concrete, wood block, and littered floors. Forged steel wheels provide maximum strength and durability—even under loads as heavy as 7,000 pounds. They are virtually indestructible within their capacity range. Use them in the toughest applications and on the most demanding floors, with the heaviest loads. Highly resistant to extreme temperatures, Nylon HD wheels are extra heavy duty. Able to take loads up to 10,000 lbs and will not chunk or separate under load. Resilient to bearing and friction heating. Smooth rolling and kind to floors. The Omega wheel can eliminate the need for spring casters. It achieves its high capacities and enhanced impact-absorbing ability with a patented web/spoke design. It flexes to cushion the load then rebounds to original shape. Resists tearing and chunking, and won't pick up metal chips. Also known as mold-on rubber, the rubber on iron wheel is floor-protective, provides long tread life, operates quietly, and is highly resilient. Suggested for almost all kinds of floors and for a variety of applications. It's well-suited for towline applications of the kind often found in freight terminals or warehouses. Capacities rival those of steel wheels. Careful attention is paid during the bonding process to assure that each wheel meets high performance standards. UI wheels are non-marking, and resistant to abrasion, chemicals, and oil. These wheels will typically outlast rubber wheels. Forged V-Groove wheels can bear loads 30% greater than cast iron V-Groove wheels and are well suited for shock loading. They are machined with a 90 degree groove for operation on inverted angle iron track and are used to control the flow of a load. Mounting Plate: 5-1/4" x 7-1/4" x 3/8"
Bolt Hole Spacing: 3-3/8" x 5-1/4", slotted to 4-1/8" x 6-1/8"
Typical applications include dollies, utility carts, tow line and platform trucks. This caster is also ideal for: tow lines, shock load applications and abusive conditions, production line dollies and trucks used in various industries including but not limited to: boat and ship molding and building, automotive, aerospace, metal fabricating, metal forging, heavy machinery and equipment, military equipment, mobile homes, etc. Tractor pulled trailers, extreme duty platform trucks and material handling carts, air cargo and ground support equipment, storage tanks, gantries and heavy duty processing equipment, coliseum and gymnasium equipment, shipping/receiving carts, warehousing and freight terminal dollies and carts, and countless other heavy duty applications. RWM's patented offset precision-machined raceway exerts radial force evenly where there is full contact between the ball bearing and the raceway. RWM's unique design adds more mass at key points. This, plus more thorough heat treatment, provides additional strength and combats brinelling into the core material. 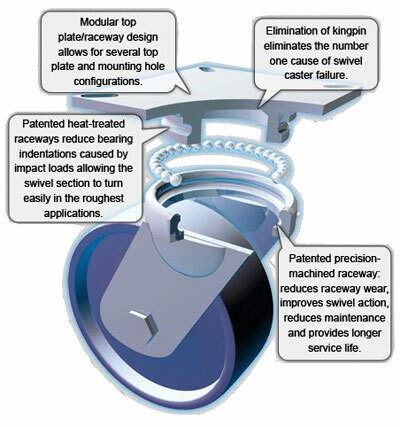 The inline positioning of many competitive raceways (as opposed to the offset positioning RWM uses) creates a direct hammering effect via the ball bearings, which are centered on the tangent of the two raceways, stressing, and eventually eroding the raceway. The inevitable result is a loose fit and progressive swivel failure. Even double raceways are subject to these hammering forces.